I rolled my new project out of the storage lot, and took it home to start bringing it back to life. I bought the car back in January of this year, and have been gathering parts in order to make it a reality instead of an idea. 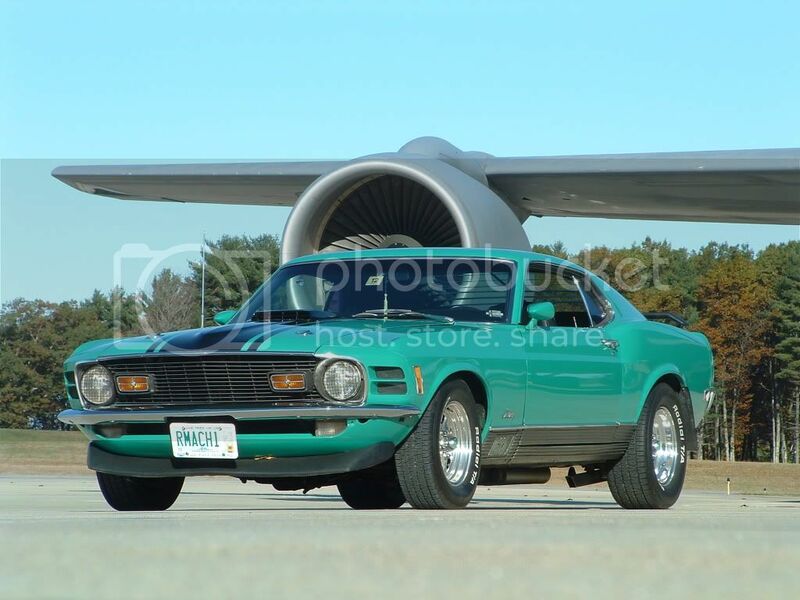 This is a true Graber Special, Marti report and all, also know as a "poor mans" Boss 302. This one had a 302 2v, auto, manual drum, and power steering. I told my Wife when I bought it, that I purchaced a rolling roof with a title. She had not seen it since its purchace and was questioning my sanity after rolling it off the trailer. I have started with worse, and at least this project is fairly well "rust free" (ha-ha). It will stay Grabber Green, but the build will be a G-Machine theme. I am waiting on Street and Track to come out with their new rear suspension later this year, to see what they come up with. I am going to try out Dynacorn sheet metal on this build, and see if it fits any better than some of the other ti-chen stampings offered by other vendors. The full quarters look good out of the box, hope they don't require a bunch of fitting (cutting in half, beating, re building,ect...). Been there, done that. I did go ahead and get the Goodmark mini tubed inner fenders to use, I could have widened some regular ones, which would have been cheeper in the long run. I would like to be able to build these cars on a regular basis, so this one is going to be sort of an extream advertisment. I am not going to jump into a business venture quite yet, but ease into it, if it works. Playing with rusty old cars has been part of my life, and I enjoy most every aspect of it. Well see where it goes. Sounds like a fun build. You could build a 69/70 Hybrid. I always liked the 69 face & 70 marker lights. sounds like a great project,,, cant wait to see the progress!!!! when you minitube a mustang, how do you deal with the interior? do you plan on going with some custom fiberglass interior panels to provide the needed space for the wheel well? for awhile i was kicking myself for not working in that area for a simple 1-1.5 extra while looking stock. then it hit me the interior panel would have been a problem anyways. to the OP, i'm a big fan of the grabber colors! I just came in from my "play room", that I didn't get to spend much time in today. (Was out putting mulch around flowers, weee!) Spent a couple of hours removing parts (stainless brightwork, glass, the 3 pcs left in the back seat area...) and was thinking about the area that the new 2" wider wheel wells are going to occupy. This car has a non fold down rear seat, which I personally don't care for, but as I got to measuring, the non fold down set up might be fairly easy to get away with the stock pannels. The pannel that holds up the rear of the seat will have to be trimmed about 5/8" on either side, and some custom brackets made, and maby some shoe horning of the seat back, should not be bad at all. I am going to do a rear seat delete anyway, but I probably will use most of these stock seat parts to create an area that will be nice. I personally have not mini tubed an coupe yet, but I am shure there has to be a way to make the interior pcs work, with out too much drama. I'd be willing to try and see! As I was digging into this car, I removed the trim around the windshield, and was removing the cowl pannel, and the squirles nest, then I had a nice surprise, I could see the concrete floor through the car (someone has all ready removed the floors, less work for me!?) , so I suppose a Cowl pannel assy. will be in order, that will be fun. I bet if you kept the tubs to 1.5, everything would fit except for custom brackets, it wouldn't be bad at all. It wouldn't be bad to just put a 1.5" strip in and move the stock pannels in. I'd do a bunch of measuring before hand though, just to make shure. i would like to see what you come up with for interior. those fiberglass panels are basically right up against the inner wheel house. 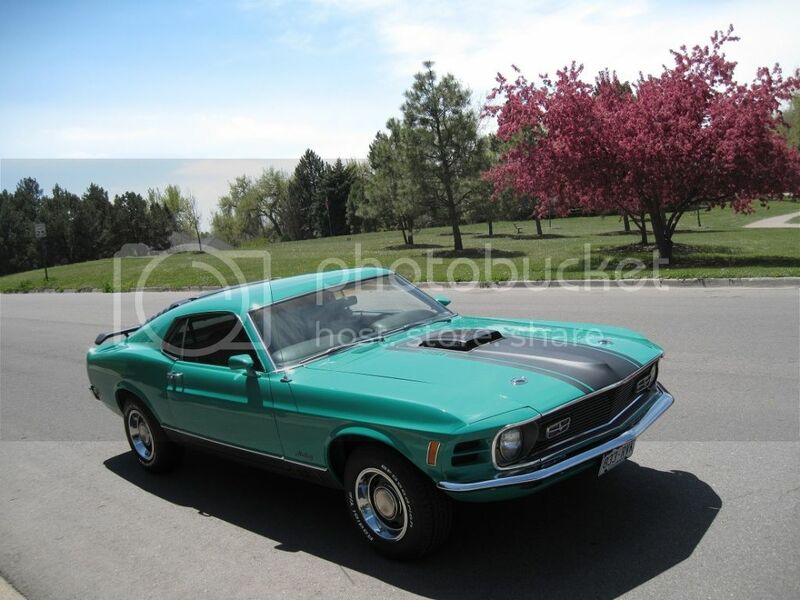 good to see another grabber green mustang show up on the board, don't see many of them. It'll be fun watching your build as you go through it. Hmmm, I cut the flange off the bottoming out rubber frame thingy and also flattened the bottom lip of the inner wheel housings. Hoping thats enough. What size tire are you running in the rear? The weel wells on 69-70 are huge (in stock form) conpaired to a 65-66 car. Putting the inner flush to the frame rail and removing the bump stop completely ought to open things up alot. Trimming the bump stop and some hammer work, should be able to stuff some pretty respectable size rubber under the back. Just an update, slowly taking this thing apart, and Mother Nature has not been nice to it. Not as bad as some I've rebuilt. I am glad they are making pretty much all of the sheet metal, cause I'm going to have a do it your self Dynacorn replacement body when I am done. Just a couple of pannels at a time. At least the roof is good. I have a couple of other removable pcs left, and the dash, then it is time to get rid of rust! Right now when you bump it, it rains rusty particles all over the floor. Gotta love it!!! Does the "R" on the tag stand for 428 R code? Check out the Grabber Regestry, as they have alot of info on these cars. Also, you can regester with them. I have, it just has not shown up yet. Nice car, and color! Thanks, no the "R" is short for "our" Mach 1. Looks like an R model behind the car. Tail number? You in the guard? I used to work on those about 25 years ago. Just about to start with the rust removal, enven though most of it is gone, along with the pannel, this is going to be fun. Started melting the led seams out of it this evening, and guess what? More rust! I am trying to put as many Dynacorn parts into this build as possible, which reminds me that I need to oder a rear window pannel and the inner parts to the B pillars... Has anyone installed a 1 pc floor pan in their project? I am goint to put a roll bar, and through the floor frame connectors, and I don't know if the expence out weighs the "ease" of a 1 pc floor, espically since I am going to cut it up. Oh yea, since everyone is talking about service, I was in the AF from 1988-1996. I was in TAC, and worked Depot Level structure repair on F-4, F-16, and FA-18 aircraft. I got to see a bunch of shot up and crashed aircraft, and got to rebuild them. That was cool!